Step into Juneau's awe-inspiring landscape with a visit to both the Mendenhall Glacier and Glacier Gardens Rainforest Adventure. Begin a fully narrated tour with a drive past downtown Juneau en route to the gardens. There, join a forest guide aboard a covered shuttle for a mile-long journey into the heart of the rainforest, including breathtaking views of the Mendenhall Valley. Then, venture to the Mendenhall Glacier and capture a memorable moment at the photo lookout. • Glacier Gardens Rainforest Adventure: Take a guided tour through a lovingly crafted landscape that features upside-down trees. • Thunder Mountain: Travel to a 580-foot elevation for a panoramic view of the Mendenhall Valley, Chilkat Mountains and Gastineau Channel. 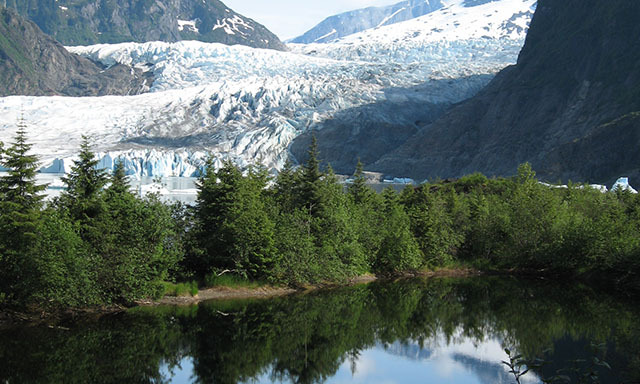 • Mendenhall Glacier: Visit and photograph Juneau's star attraction, the largest, most accessible glacier in the world. • U.S. Forest Service staff are available throughout the Mendenhall Glacier Visitor Center complex to answer questions and provide interesting information.